Trivedi D., et al. Assessment of Biofield Energy Treatment on Liver Health Using Hepatocellular Carcinoma Cell Line (HepG2) (2018) J Gastrointest Disord Liver Func 4(1): 17- 23. Liver is the main metabolic organ in human. Most of the chemicals are primarily metabolized in the liver followed by excretion of the metabolites from the body. Therefore, there is a high chance of liver damage and most of the peoples are suffering many diseases due to their poor metabolic power of liver. In this context, the present study was performed to find out the potential role of the Biofield Energy (The Trivedi Effect®) Treated test item (DMEM) in HepG2 cell line. The test item was divided into two parts. One part of the test item received Consciousness Energy Healing Treatment by a renowned Biofield Energy Healer, Dahryn Trivedi and the other part defined as the untreated DMEM, where no Biofield Treatment was given. Cell viability of the test sample using MTT assay showed 152.8 % viable cells in the Biofield Energy Treated DMEM group, suggested that the test item was nontoxic and safe in nature. The Biofield Energy Treated DMEM showed 12.2 % protection of cells against oxidative stress induced by t-BHP. The level of IL-8 was significantly reduced by 13.71 % in the Biofield Energy Treated DMEM group compared to the TNF-α stimulated control group. Moreover, the level of ALT was significantly (p ≤ 0.001) reduced by 64.16 % in the Biofield Energy Treated DMEM group compared to the t-BHP group. Cholesterol level was significantly reduced by 34.94 % Biofield Energy Treated DMEM group compared to the untreated DMEM group. Besides, the Biofield Energy Treated DMEM group showed 23.19 % increased the level of albumin compared to the untreated DMEM group. Altogether, results suggested that Biofield Treatment significantly improved liver health and its function. Thus, Consciousness Energy Healing (The Trivedi Effect®) Treatment could be utilized as a hepatoprotectant against several hepatic disorders such as Gilbert’s disease, cirrhosis, steatosis, alcohol abuse, hemochromatosis, Budd-Chiari syndrome, Wilson’s disease, cholangiocarcinoma, etc. Liver disorders are the major concern of population health worldwide. Release of liver mitochondrial enzymes is considered a strong evidence for hepatic necrosis, which is associated with an increased production of reactive oxygen species (ROS) that leads to hepatic lipid peroxidation[1-3]. The use of in vitro systems for the prediction of liver damages provides several advantages over in vivo assessment. As in vitro systems require very less animals, less test material, and give high accuracy. Human hepatoma cell lines have been extensively utilized as an alternative model to human hepatocytes in vitro for the assessment of hepatoprotectant properties of any test substances. This cell line has many advantages viz. as an immortalized cell line, easily available and cryopreserved in huge quantity, and even the drug metabolizing capability do not decrease upon cultivation. Abnormal levels of liver enzymes like Alanine Amino Transferase (ALT) and Aspartate Amino Transferase (AST) may indicate liver damage or alteration in bile flow. Liver ALT activity is 3000 times than serum activity. Hence, in minor hepatocellular injury, ALT leak out from the damaged liver cells in the serum. Lots of scientific research data suggested the useful effects of Biofield Energy Treatment in cases of cancer patients via therapeutic touch, massage therapy, etc. Complementary and Alternative Medicine (CAM) therapies are preferred models of treatment, among which Biofield Therapy (or Healing Modalities) is one approach to enhance physical, mental and emotional human wellness. The National Center of Complementary and Integrative Health (NCCIH) has recognized and accepted Biofield Energy Healing as a CAM health care approach in addition to other therapies, medicines and practices such as chiropractic / osteopathic manipulation, natural products, deep breathing, yoga, Tai Chi, Qi Gong, meditation, massage, special diets, relaxation techniques, homeopathy, progressive relaxation, guided imagery, acupuncture, hypnotherapy, healing touch, movement therapy, pilates, mindfulness, rolfing structural integration, Ayurvedic medicine, acupressure, traditional Chinese herbs and medicines, naturopathy, Reiki, essential oils, aromatherapy, and cranial sacral therapy. Human Biofield Energy has subtle energy that has the capacity to work in an effective manner. CAM therapies have been practiced worldwide with reported clinical benefits in different health disease profiles. This energy can be harnessed and transmitted by the experts into living and non-living things via the process of Biofield Energy Healing. The Trivedi Effect®- Consciousness Energy Healing Treatment has been reported with a significant revolution in the field of materials science[12-14], agriculture[15,16], microbiology[17-19], biotechnology[20,21], nutraceuticals[22,23], cancer research[24,25]. Apart from this, The Trivedi Effect® also tremendously improved bioavailability of various low bioavailable compounds[26-28], an improved overall skin health[29,30], bone health[31-33], human health and wellness. There are many limitations for conducting liver disease research in human beings due to the high cost and potential ethical issues. Therefore, the authors intend to develop a new treatment modality to study the impact of the Biofield Energy Healing Treatment (The Trivedi Effect®) on the test item (DMEM) for liver hepatocyte cells. Chemicals and reagents: Antibiotics solution (penicillin-streptomycin) was purchased from HiMedia. Dulbecco’s Modified Eagle Medium (DMEM) and fetal bovine serum (FBS) were obtained from Gibco, India. Alanine Amino Transferase (ALT) and Aspartate Amino Transferase (AST), 3-(4, 5-Dimethylthiazol-2-yl)-2, 5-Diphenyltetrazolium Bromide (MTT) and Ethylenediaminetetraacetic Acid (EDTA) were obtained from Sigma Chemical Co. (St. Louis, MO). The positive controls silymarin and mevinolin were procured from Sanat products ltd., India and Zliesher Nobel, respectively. All the other chemicals used in this experiment were analytical grade procured from India. Biofield energy healing strategy: The test item (DMEM) was used in this experiment and one portion was considered as the untreated DMEM group, where no Biofield Treatment was provided. Further, the untreated group was treated with “sham” healer for comparison purpose. The sham healer did not have any knowledge about the Biofield Energy Healing Treatment. The other portion of the test item was received Biofield Energy Treatment and defined as the Biofield Energy Treated DMEM group. Biofield Energy Healing Treatment (known as The Trivedi Effect®) was received under laboratory conditions for 3 minutes through Dahryn Trivedi’s unique Biofield Energy Transmission process. Biofield Energy Healer was located in the USA; however the test items were located in the research laboratory of Dabur Research Foundation, New Delhi, India. Biofield Energy Healer in this experiment did not visit the laboratory, nor had any contact with the test samples. After that, the Biofield Energy Treated and untreated test items were kept in similar sealed conditions and used for the study as per the study plan. Assessment of cell viability using MTT assay: The cell viability was performed by MTT assay in HepG2 cell line. The cells were counted and plated in a 96-well plate at the density corresponding to 10 X 103 cells / well / 180 μL in DMEM + 10 % FBS. The cells in the above plate(s) were incubated for 24 hours in a CO2 incubator at 37°C, 5 % CO2, and 95 % humidity. Following incubation, the medium was removed and the following treatments were given. In the test item group, 200 μL of the test item was added to wells, in the control group, added 200 μL of serum free medium. Besides, in the positive control group, added 180 μL of serum free medium with 20 μL of positive controls were added from the respective 10X stock solutions. After incubation for 48 hours, the effect of test item on cell viability was assessed by MTT assay. 20 μL of 5 mg / mL of MTT was added to all the wells and incubated at 37°C for 3 hours. The supernatant was aspirated and 150 μL of DMSO was added to all wells to dissolve formazan crystals. The Optical Density (OD) of each well was read at 540 nm using Biotek Reader. For positive control, concentrations resulting in ≥ 70% cell viability were taken as safe / non-cytotoxic for cytokine estimation. Statistical analysis: All the values were represented as Mean ± SEM of three independent experiments. For multiple group comparison, one-way analysis of variance (ANOVA) was used followed by post-hoc analysis by Dunnett’s test. Statistically significant values were set at the level of p ≤ 0.05. Assessment of cell viability using MTT assay: The results of the cell viability after treatment with the positive controls and the Biofield Energy Treated test item in HepG2 cells are shown in Figure 1. 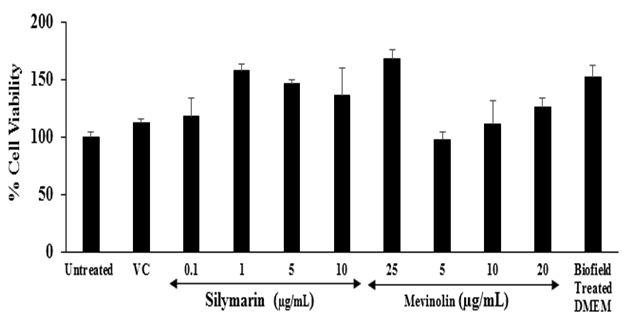 The positive controls, silymarin showed more than 118 % viable cells at the concentrations between 0.1 to 25 μg / mL and mevinolin showed greater than 97 % cell viability up to 20 μg / mL. Besides, the Biofield Energy Treated DMEM showed 152.8 % cell viability. Overall, the positive controls and the Biofield Energy Treated test item found more than 90 % cell viability, which indicated a safe and nontoxic profile of the test items. Evaluation of cytoprotective effect of the test item: Chronic liver inflammation is one of the liver diseases. To assess the hepatoprotective activity of the test compound, tert-butyl hydroperoxide (t-BHP) is a well reported oxidative stress inducer in the in vitro cell-based assays[34,35]. The protective effect of the Biofield Energy Treated test item on the restoration of cell viability of HepG2 cells was determined against t-BHP induced cell damage. The cytoprotective effect of the test item against t-BHP induced damage after 4 hours of treatment is shown in Figure 2. 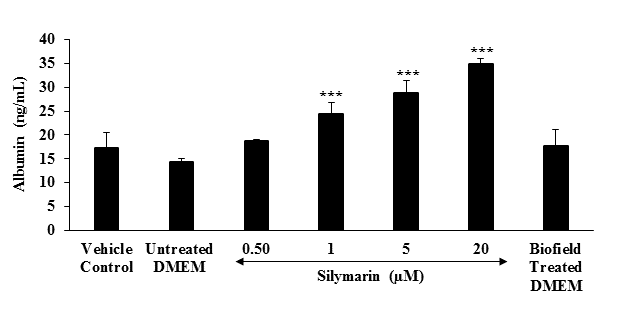 Silymarin resulted, restoration of cell viability by 4.9 %, 38.4 %, and 66.1 % at 1, 5, and 25 μg / mL, respectively compared to the control (t-BHP damaged cells) group. Further, the Biofield Energy Treated DMEM group showed 12.2 % restoration of cell viability compared to the control (t-BHP damaged cells) group. Inflammation can increase the oxidative stress and simultaneously reduces the cellular antioxidant capacity. More production of free radicals can directly react with the lipid component of the cell membrane and proteins and finally stop their function. Consequently, in the state of chronic inflammation causes mutation and DNA damage leads to wide variety of age-related diseases like diabetes, cardiovascular, autoimmune diseases, and cancer[37-39]. The results suggest that Biofield Energy Treatment has the significant cytoprotective activity, which could be due to the effect of Consciousness Energy Healing Treatment (The Trivedi Effect®). Therefore, Biofield Energy Healing Treatment might significantly improve the protection against oxidative cell damage that leads to a better liver health against many liver disorders. Figure 2: Assessment of cytoprotective effect of the test item (DMEM) in HepG2 cells against tert-butyl hydroperoxide (t-BHP) induced damage after 4 hours of treatment. VC: Vehicle control (DMSO). All the values are represented as mean ± SEM of three independent experiments. ***p ≤ 0.001 vs. vehicle control group. Estimation of IL-8: IL-8 is a proinflammatory chemokine that recruits white blood cells and neutrophils to the site of infection or tissue injury or the areas of inflammation. The effect of the test item on the proinflammatory mediator interleukin-8 (IL-8) is shown in Figure 3. Increased level of oxidative stress causes increased secretion of IL-8, and ultimately recruit the inflammatory cells causes’ localized inflammation. 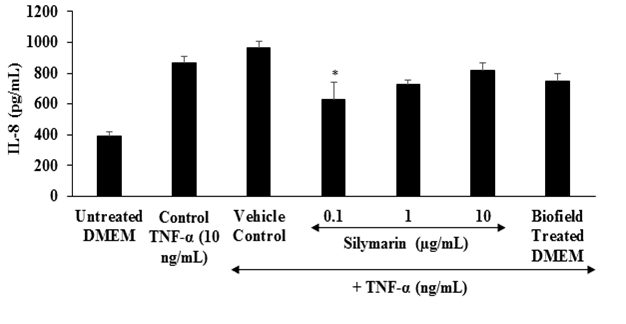 From Figure 3, it was observed that the positive control, silymarin showed a significant reduction of IL-8 by 27.74 % at 0.1 μg / mL compared to the control TNF-α stimulation group. Besides, the Biofield Energy Treated DMEM group showed 13.71% reduction of IL-8 compared to the control TNF-α stimulation group. Figure 3: The effect of the test item on the level of interleukin-8 (IL-8) against TNF-α, stimulation after 24 hours of treatment. TNF-α: Tumor necrosis factor alpha. All the values are represented as mean ± SEM of three independent experiments. *p ≤ 0.05 vs. vehicle control group. Estimation of liver transaminases: The effects of the test item on the level of liver cytoprotective enzymes Alanine Amino Transferase (ALT) and Aspartate Amino Transferase (AST) are shown in Figure 4. The level of ALT in the untreated DMEM, t-BHP, and vehicle control groups was 2.99, 5.72, and 5 nMol / min / mL, respectively. Besides, the level of AST in the untreated DMEM, t-BHP, and vehicle control groups was found as 0.7, 5.18, and 4.3 nMol / min / mL, respectively. The positive control, silymarin showed 19.93 %, 34.97 %, and 81.82 % reduction of ALP level at 1, 5, and 25 μg / mL, respectively with respect to t-BHP induced group. Moreover, the level of AST was also significantly reduced by 38.42 %, 85.71 %, and 97.68 % at 1, 5, and 25 μg / mL, respectively with respect to t-BHP stimulation group. Besides, Biofield Energy Treated DMEM group was significantly reduced the level of ALT by 64.16 % compared to the t-BHP treated group. ALT is an indicator of liver disease. In the case of hepatocellular injury the levels of serum ALT and AST become increased. Thus, the elevation of serum ALT / AST enzymes chances of clinically significant liver disorders. In this experiment, the Biofield Energy Treated DMEM has significantly protected liver hepatocytes in terms of reducing the level of transaminases enzyme, ALT compared to the t-BHP inducing group. 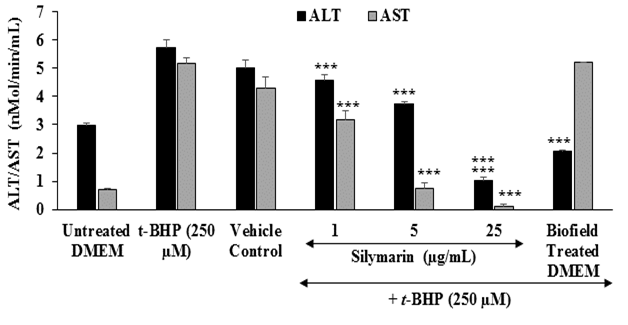 Figure 4: The effect of the test item on alanine amino-transaminase (ALT) and aspartate amino-transaminase (AST) activity against tert-butyl hydroperoxide (t-BHP) induced damage after 4 hours of treatment. All the values are represented as mean ± SEM of three independent experiments. ***p ≤ 0.001 vs. t-BHP group. Estimation of cholesterol: The effect of the test item on the level of cholesterol in shown in Figure 5. The level of cholesterol in the vehicle control and untreated groups was 2.12 ± 0.5 and 1.66 ± 0.7 μg / μL, respectively. 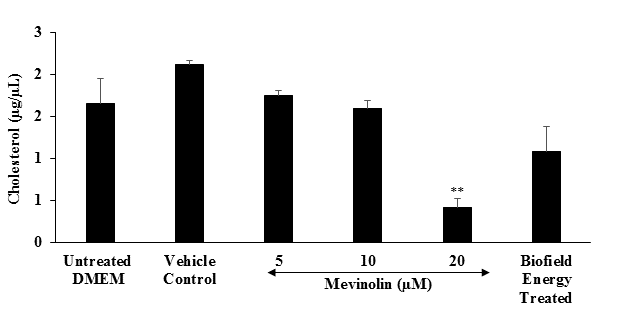 The positive control, mevinolin showed 17.58 %, 25.08 %, and 80.11 % (p ≤ 0.01) inhibition of cholesterol synthesis at 5, 10, and 20 μM, respectively. Besides, cholesterol synthesis was significantly inhibited by 34.94 % in the Biofield Energy Treated group as compared to the untreated DMEM group. Liver plays an important role in lipid metabolism, synthesis, and transportation. Hence, manifestation of an abnormal lipid profile due to liver dysfunction. Figure 5: The effect of the test item (DMEM) on the level of cholesterol synthesis in HepG2 cells after 24 hours of treatment. All the values are represented as mean ± SEM of three independent experiments. **p ≤ 0.01 vs.. untreated DMEM group. Estimation of albumin: The effect of the test item (DMEM) on the level of albumin in shown in Figure 6. The albumin level was 17.27 and 14.4 ng / mL in the vehicle control (VC) and untreated DMEM groups, respectively. The level of albumin in the positive control (silymarin) group was significantly (p ≤ 0.001) increased by 29.65 %, 69.51 %, 100.21 %, and 142.78 % at 0.5, 1, 5, and 20 μM, respectively compared to the untreated DMEM group. Besides, Biofield Energy Treated group showed 23.19 % increased the level of albumin compared to the untreated DMEM group. Based on the literature, albumin can transport water insoluble molecules, metals, and drugs including antibiotics, and detoxify various endogenous and exogenous substances. Besides, it acts as an antioxidant by scavenging reactive oxygen species[45,46]. Overall, data indicated that Biofield Energy Treatment has significantly improved the level of albumin compared to the untreated DMEM group. Figure 6: Effect of the test item on albumin in HepG2 cells after 48 hours of treatment. All the values are represented as mean ± SEM of three independent experiments. ***p ≤ 0.001 vs. untreated DMEM group. The study results showed that the test items were safe and non-toxic based on MTT cell viability assay. The Biofield Energy Treated test item (DMEM) showed 12.2 % protection of liver cells from the oxidative damage as compared to the t-BHP induced control group. The proinflammatory cytokine, IL-8 was significantly reduced by 13.71 % in the Biofield Energy Treated DMEM group compared to the TNF-α stimulated control group. Moreover, liver ALT was significantly (p ≤ 0.001) reduced by 64.16 % in the Biofield Energy Treated DMEM group compared to the t-BHP group. Cholesterol level was significantly reduced by 34.94 % in the Biofield Energy Treated DMEM group compared to the untreated DMEM group. Further, Biofield Energy Treated DMEM group showed 23.19 % increased the level of albumin compared to the untreated DMEM group. In conclusion, The Trivedi Effect® - Consciousness Energy Healing Treatment significantly protect liver cells from the t-BHP induced oxidative stress group and it can be used as a complementary and alternative treatment for the prevention of various types of hepatobiliary disorders viz. acute hepatitis A, B, C, D, and E, chronic viral hepatitis, portal hypertension in schistosomiasis, toxoplasmosis, hepatosplenic schistosomiasis, liver abscess, autoimmune hepatitis, primary biliary cholangitis (Primary Biliary Cirrhosis), phlebitis of the portal vein, granulomatous hepatitis, cholestasis, necrosis, cirrhosis, etc. Further, it could be useful to improve cell-to-cell messaging, normal cell growth and differentiation, cell cycling and proliferation, neurotransmission, skin health, hormonal balance, immune and cardiovascular functions. Moreover, it can also be utilized in organ transplants (i.e., kidney, liver, and heart transplants), hormonal imbalance, aging, and various inflammatory and immune-related disease conditions like Alzheimer’s Disease (AD), Ulcerative Colitis (UC), Dermatitis, Asthma, Irritable Bowel Syndrome (IBS), Hashimoto Thyroiditis, Pernicious Anemia, Sjogren Syndrome, Multiple Sclerosis, Aplastic Anemia, Hepatitis, Graves’ Disease, Dermatomyositis, Diabetes, Parkinson’s Disease, Myasthenia Gravis, Atherosclerosis, Systemic Lupus Erythematosus (SLE), stress, etc. with a safe therapeutic index to improve overall health and Quality of Life. 1. Contreras-Zentella, M.L., Hernández-Muñoz, R. Is liver enzyme release really associated with cell necrosis induced by oxidant stress? (2016) Oxid Med Cell Longev: 3529149. 2. Schmidt, E., Schmidt, F.W. Aspects of enzyme diagnosis. (1970) Med Welt 21: 805-816. 3. Frederiks, W.M., Vogels, I.M., Fronik, G.M. Plasma ornithine carbamyl transferase level as an indicator of ischaemic injury of rat liver. (1984) Cell Biochem Funct 2(4): 217-220. 4. Jessen, B.A., Mullins, J.S., de Peyster, A., et al. Assessment of hepatocytes and liver slices as in vitro test systems to predict in vivo gene expression. (2003) Toxicol Sci 75(1): 208-222. 5. Duthie, S.J., Melvin, W.T., Burke, M.D. Bromobenzene detoxification in the human liver-derived HepG2 cell line. (1994) Xenobiotica 24(3): 265-279. 6. Sassa, S., Sugita, O., Galbraith, R.A., et al. Drug metabolism by the human hepatoma cell, HepG2. (1987) Biochem Biophys Res Commun 143(1): 52-57. 7. Price, C., Alberti, K. Biochemical assessment of liver function. In: Wright R, et al., eds. Liver and biliary diseases-pathophysiology, diagnosis, management. (1979) London: W. B. Saunders 381-416. 8. Lutgendorf, S.K., Mullen-Houser, E., Russell, D., et al. Preservation of immune function in cervical cancer patients during chemoradiation using a novel integrative approach. (2010) Brain Behav Immun 24(8): 1231-1240. 9. Ironson, G., Field, T., Scafidi, F., et al. Massage therapy is associated with enhancement of the immune system’s cytotoxic capacity. (1996) Int J Neurosci 84(1-4): 205-217. 10. Jain, S., Hammerschlag, R., Mills, P., et al. Clinical studies of biofield therapies: Summary, methodological challenges, and recommendations. (2015) Glob Adv Health Med 4: 58-66. 11. Rubik, B. The biofield hypothesis: Its biophysical basis and role in medicine. (2002) J Altern Complement Med 8(6): 703-717. 12. Trivedi, M.K., Tallapragada, R.M. A transcendental to changing metal powder characteristics. (2008) Met Powder Rep 63(9): 22-28, 31. 13. Trivedi, M.K., Nayak, G., Patil, S., et al. Studies of the atomic and crystalline characteristics of ceramic oxide nano powders after bio field treatment. (2015) Ind Eng Manage 4(3): 161. 14. Trivedi, M.K., Nayak, G., Patil, S., et al. Effect of biofield energy treatment on physical and structural properties of calcium carbide and praseodymium oxide. (2015) Int J Mat Sci Appl 4(6): 390-395. 15. Trivedi, M.K., Branton, A., Trivedi, D., et al. Morphological characterization, quality, yield and DNA fingerprinting of biofield energy treated alphonso mango (Mangifera indica L.). (2015) J Food Nut Sci 3: 245-250. 16. Trivedi, M.K., Branton, A., Trivedi, D., et al. Evaluation of biochemical marker – Glutathione and DNA fingerprinting of biofield energy treated Oryza sativa. (2015) Ame J Bio Sci 3(6): 243-248. 17. Trivedi, M.K., Branton, A., Trivedi, D., et al. Phenotyping and 16S rDNA analysis after biofield treatment on Citrobacter braakii: A urinary pathogen. (2015) J Clin Med Genom 3(1): 129. 19. Trivedi, M.K., Patil, S., Shettigar, H., et al. An impact of biofield treatment: Antimycobacterial susceptibility potential using BACTEC 460/MGIT-TB System. (2015) Mycobact Dis 5(4): 189. 20. Trivedi, M.K., Patil, S., Shettigar, H., et al. Phenotypic and biotypic characterization of Klebsiella oxytoca: An impact of biofield treatment. (2015) J Microb Biochem Technol 7: 203-206. 21. Nayak, G., Altekar, N. Effect of biofield treatment on plant growth and adaptation. (2015) J Environ Health Sci 1(2): 1-9. 22. Trivedi, M.K., Branton, A., Trivedi, D., et al. A Systematic study of the biofield energy healing treatment on physicochemical, thermal, structural, and behavioral properties of magnesium gluconate. (2017) Int J Bioorg Chem 2(3): 135-145. 23. Parulkar, V.R., Trivedi, M.K., Branton, A., et al. Improved metabolism of vitamin d3 in human osteoblasts cells after biofield energy healing treatment. (2018) Am J Labor Med 3(1): 11-19. 24. Trivedi, M.K., Patil, S., Shettigar, H., et al. The potential impact of biofield treatment on human brain tumor cells: A time-lapse video microscopy. (2015) J Integr Oncol 4: 141. 25. Trivedi, M.K., Patil, S., Shettigar, H., et al. In vitro evaluation of biofield treatment on cancer biomarkers involved in endometrial and prostate cancer cell lines. (2015) J Cancer Sci Ther 7: 253-257. 26. Branton, A., Jana, S. The influence of energy of consciousness healing treatment on low bioavailable resveratrol in male Sprague Dawley rats. (2017) Int J Clin Devel Anat 3(3): 9-15. 27. Branton, A., Jana, S. The use of novel and unique biofield energy healing treatment for the improvement of poorly bioavailable compound, berberine in male Sprague Dawley rats. (2017) Ame J Clin Exp Med 5(4): 138-144. 28. Branton, A., Jana, S. Effect of The biofield energy healing treatment on the pharmacokinetics of 25-hydroxyvitamin D3 [25(OH)D3] in rats after a single oral dose of vitamin D3. (2017) Ame J Pharm Phyto 2(1): 11-18. 29. Parulkar, V.R., Trivedi, M.K., Branton, A., et al. The use of consciousness energy healing based herbomineral formulation for skin anti-aging strategies. (2017) J Food Nut Sci 5(3): 96-106. 30. Singh, J., Trivedi, M.K., Branton, A., et al. Consciousness energy healing treatment based herbomineral formulation: A safe and effective approach for skin health. (2017) Amer J Pharmacology and Phytotherapy 2(1): 1-10. 31. Anagnos, D., Trivedi, K., Branton, A., et al. Influence of biofield treated vitamin D3 on proliferation, differentiation, and maturation of bone-related parameters in MG-63 cell-line. (2018) Inter J Biomed Eng Clin Sci 4(1): 6-14. 32. Lee, A.C., Trivedi, K., Branton, A., et al. The potential benefits of biofield energy treated vitamin D3 on bone mineralization in human bone osteosarcoma cells (MG-63). (2018) Int J Nut Food Sci 7(1): 30-38. 33. Stutheit, M.E., Trivedi, K., Branton, A., et al. Biofield energy treated vitamin D3: Therapeutic implication on bone health using osteoblasts cells. (2018) Ame J Life Sci 6(1): 13-21. 34. Alía, M., Ramos, S., Mateos, R., et al. Response of the antioxidant defense system to tert-butyl hydroperoxide and hydrogen peroxide in a human hepatoma cell line (HepG2). (2005) J Biochem Mol Toxicol 19(2): 119-128. 35. Vargas-Mendoza, N., Madrigal-Santillán, E., Morales-González, A., et al. 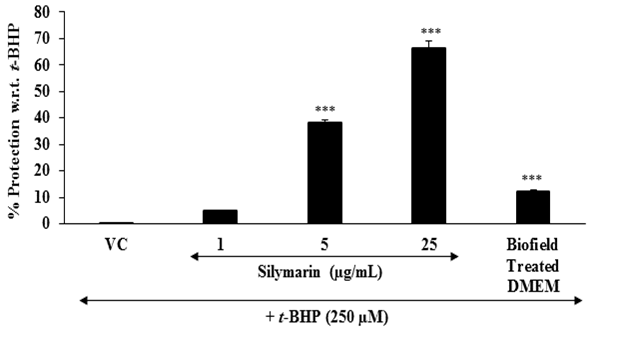 Hepatoprotective effect of silymarin. (2014) World J Hepatol 6: 144-149. 36. Webb, C., Twedt, D. Oxidative stress and liver disease. (2008) Vet Clin North Am Small Anim Pract 38(1): 125-135. 37. Sha, Li., Hor-Yue, T., Wang, N., et al. The role of oxidative stress and antioxidants in liver diseases. (2015) Int J Mol Sci 16(11): 26087-26124. 38. Cheresh, P., Kim, S.J., Tulasiram, S., et al. Oxidative stress and pulmonary fibrosis. (2013) Biochim Biophys Acta 1832(7): 1028-1040. 39. Lu, L.Y., Ou, N., Lu, Q.B. (2013) Antioxidant induces DNA damage, cell death and mutagenicity in human lung and skin normal cells. Sci Rep 3: 3169. 40. Baggiolini, M., Walz, A., Kunkel, S.L. Neutrophil-activating peptide-1/interleukin 8, a novel cytokine that activates neutrophils. (1989) J Clin Invest 84(4): 1045-1049. 41. Vlahopoulos, S., Boldogh, I., Casola, A., et al. Nuclear factor-kappaB-dependent induction of interleukin-8 gene expression by tumor necrosis factor alpha: Evidence for an antioxidant sensitive activating pathway distinct from nuclear translocation. (1999) Blood 94(6): 1878-1889. 42. Mathiesen, U., Franzen, L., Fryden, A., et al. The clinical significance of slightly to moderately increased liver transaminase values in asymptomatic patients. (1999) Scand J Gastroenterol 34(1): 85-91. 43. Ghadir, M.R., Riahin, A.A., Havaspour, A., et al. The relationship between lipid profile and severity of liver damage in cirrhotic patients. (2010) Hepat Mon 10(4): 285-288. 44. Vincent, J.L. Relevance of albumin in modern critical care medicine. (2009) Best Pract Res Clin Anaesthesiol 23(2): 183-191. 45. Evans, T.W. Review article: Albumin as drug-biological effects of albumin unrelated to oncotic pressure. (2002) Aliment Pharmacol Ther 5: 6 -11. 46. Quinlan, G.J., Margarson, M.P., Mumby, S., et al. Administration of albumin to patients with sepsis syndrome: A possible beneficial role in plasma thiol repletion. (1998) Clin Sci (Lond) 95(4): 459-465.